1 The first step in finishing is milling the stretcher profiles from the rough boards, with the necessary precision and skill to result in exceptionally smooth, accurate profiles. 2 Cutting the stretcher bars to size again happens with constant precision, simultaneously removing undesirable sections such as loose or over-large knots and monitoring the levelness of the cut sections. 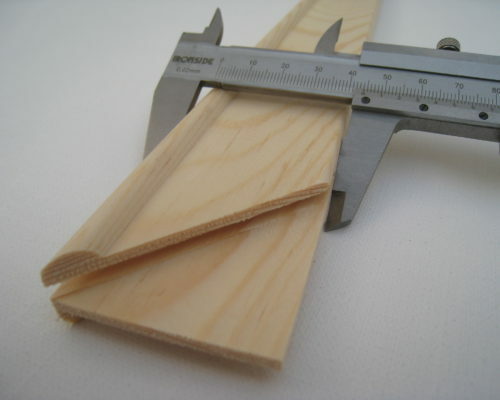 The perfect size is irrelevant if you can’t also ensure that the stretcher bars are perfectly straight. You can’t make a level frame from warped stretcher bars, after all. 3 The routing of the pins and cutting of the slots is measured with the utmost precision, allowing the stretcher bars to fit together with just the right amount of tension, not too tight and not too loose. Years of experience and specialisation combine with a passion for our work to allow us to provide top-notch quality to the most demanding customers.